BotVax B (Neogen) is a Botulism vaccine for horses. 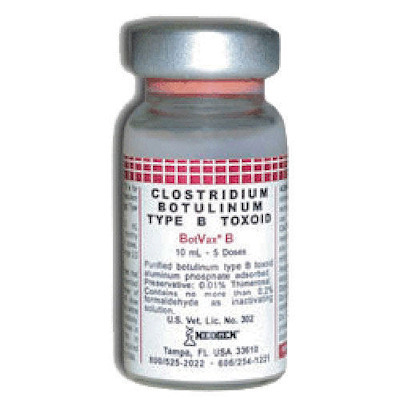 10ml vial (5 Doses) inject 2ml per horse,for the prevention of equine botulism due to Clostridium botulinum Type B in healthy horses. Directions:Inject 2 mL intramuscularly, using aseptic technique, at monthly intervals for a total of 3 doses. Booster annually with a single 2 mL intramuscular dose. Shake well before use. Research has demonstrated that pregnant mares immunized during the third trimester of gestation, with the third dose (booster) given 2-4 weeks before parturition, respond with antibody. This antibody is concentrated in colostrum and results in significant passively acquired antibody in normal suckling foals. Ingredients: Purified botulinum type B toxoid, aluminum phosphate absorbed.